An aging racer faces new hurdles. “The good news is that Cars 3 is better than Cars 2,” said Christopher Orr in The Atlantic. “The bad news is that by Pixar standards, it’s still not good.” An “exceptionally” familiar story about a has-been attempting a comeback, the franchise’s third installment at least puts the spotlight back on Lightning McQueen, a talking red race car voiced by Owen Wilson. But though the visuals are superb, the movie lacks the emotional impact of Pixar classics like Toy Story; it feels built to sustain the franchise’s rich merchandise sales. Still, the movie’s four-wheeled stars are “about as likable as can be,” said Richard Roeper in the Chicago Sun-Times. After Lightning crashes while trying to keep up with a new breed of supercars, he teams up with a new mentor (Chris Cooper) and a spunky trainer (Cristela Alonzo) who help him chase one last shot at glory. The ensuing story is both “breezy fun” and “a pain-free life-lesson delivery vehicle,” said Glenn Kenny in The New York Times. 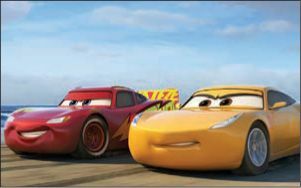 Because Lightning eventually realizes that his trainer belongs on a track more than he does, Cars 3 offers “a quiet but ultimately forceful” case against sexism and for the joys of mentorship. A bachelorette party goes off the rails. McKinnon gives Johansson some love.